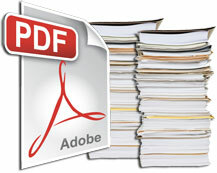 The groundwaterWater existing below the ground surface in aquifers studies undertaken during Phase 2 are summarized in Section 7.0 (921Kb PDF). 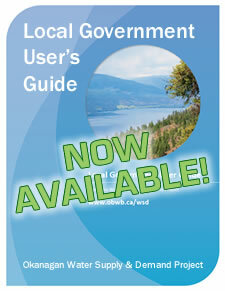 Because of minimal regulation of groundwaterWater existing below the ground surface in aquifers use, there is relatively little information on the hydrogeologyThe geology of groundwater, with particular emphasis on the chemistry and movement of water and groundwaterWater existing below the ground surface in aquifers resources of the Okanagan BasinLand area from which water drains towards a common pointThe Okanagan watershedLand area from which water drains towards a common point, or basinLand area from which water drains towards a common point, is a narrow strip that spans from Armstrong, British Columbia, Canada to the US border and includes five main lakes – Okanagan, Kalamalka-Wood, Skaha, Vaseux and Osoyoos – and surrounding mountains. The Okanagan BasinLand area from which water drains towards a common point includes all the land that feeds water to our big lakes, and is almost 200 km in length and 8,000 km2 in area. Kelowna, Vernon, Penticton and Osoyoos all lie within the Okanagan BasinLand area from which water drains towards a common point..
A conceptual model of groundwaterWater existing below the ground surface in aquifers storage and flow was developed, in which most of the groundwaterWater existing below the ground surface in aquifers activity takes place in 79 distinct shallow unconsolidated aquifers, located primarily along the lower elevation valley bottoms. Estimates of groundwaterWater existing below the ground surface in aquifers discharge to Okanagan Lake vary over a wide range, which reflects the uncertainty and relative absence of information needed to make these estimates. 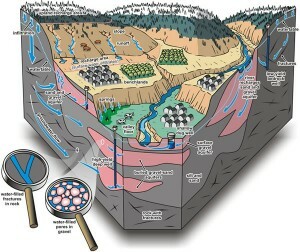 Additional hydrogeological characterization should be completed, and more data on groundwaterWater existing below the ground surface in aquifers extraction and on surface/groundwaterWater existing below the ground surface in aquifers interactions should be obtained. 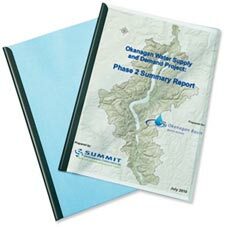 This information is needed to more adequately understand Okanagan groundwaterWater existing below the ground surface in aquifers resources. GroundwaterWater existing below the ground surface in aquifers use should be regulated using the same system used to regulate surface waterWater that flows in streams and rivers, and exists in natural lakes, wetlands, and in reservoirsArtificial lakes used to store water.